To find the printer a good first step is identifying the IP address. Today many network printers support a printing protocol which makes use of port 9100. 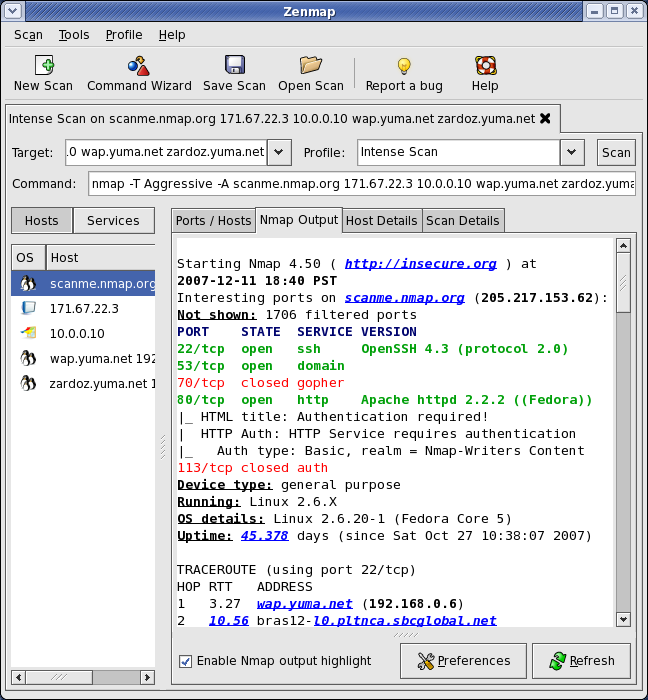 Before scanning your network with Zenmap, you must find out the IP address range of your local area network. Most Home Local Area Networks will have an IP address similar to 192.168.1.1 or 10.1.10.1. To determine which IP address is your printer, click on the “Ports/Hosts” tab, then look through the IP addresses until you find an open port 9100, this will usually say “jetdirect” or similar. Then change to make a new port and in the drop-down box select "Standard TCP/IP Port"
When asked, select the correct models drivers, click through the dialogs and start printing! Choose the free download link at the navigation bar towards the top of the page. On the free download page you will download a copy of Belarc System Advisor. Belarc System Advisior is alot like CPU-Z if you are familiar with that system profiling tool. One of the neat features of Belarc Advisor , and what makes it useful for finding a printer is that during the course of profiling the system it is run on, it also does a network scan of any available interfaces. Upon opening Belarc, it will begin doing a system profile scan, this can take a few minutes, so grab a beer/coffee and relax. After Belarc has finished its scan of your PC/Network, it will open the report as a webpage in your default browser. edit: Also if you are on windows but feel like doing things the hard way, or have a good idea what other addresses are already on your network, you can ping the broadcast address 192.168.1.255 in some home networks(based on the netmask) and then perform and arp -a to see a list of hosts your computer recognizes.